Abstract: Optical coherence tomography (OCT) is an emerging imaging modality which can generate high resolution, cross-sectional images of microstructure in biological systems. OCT is analogous to ultrasound B mode imaging, except that it uses light instead of sound. Imaging is performed by measuring the echo time delay of optical backscattering in the tissue as a function of transverse position. The penetration depth of OCT imaging is limited by attenuation from optical scattering to be 2 to 3 mm in most tissues; however, image resolutions of 1-15 um may be achieved. OCT functions as a type of "optical biopsy" to permit the in situ visualization of tissue microstructure with resolutions approaching that of conventional histopathology. Imaging can be performed in real time without the need to remove and process a specimen as in conventional biopsy and histopathology. OCT technology draws upon advances in photonics and fiber optics. Recent research has enabled dramatic improvements in resolution as well as imaging speed, and three dimensional visualization. OCT is rapidly becoming a clinical standard in ophthalmology, where it enables imaging of retinal pathology with unprecedented resolutions. OCT is also being developed for many other applications ranging from cancer detection in endoscopy, to intravascular imaging in cardiology. This presentation will discuss OCT technology and applications. Biography: James G. Fujimoto obtained his bachelors, masters, and doctorate from the Massachusetts Institute of Technology in 1979, 1981, and 1984 respectively. Since 1985 he has been on the faculty of the Department of Electrical Engineering and Computer Science at M.I.T. where he is currently Professor of Electrical Engineering and Computer Science. His research interests include the development and application of femtosecond laser technology and studies of ultrafast phenomena. He is also active in biomedical optics, including the development of optical coherence tomography imaging. Dr. Fujimoto was awarded the Baker Award of the National Academy of Sciences in 1990, the Discover Magazine Award for Technological Innovation in medical diagnostics in 1999, and was co-recipient of the Rank Prize in Optoelectronics in 2002. He was elected to the National Academy of Engineering in 2001 and the American Academy of Arts and Sciences in 2002. 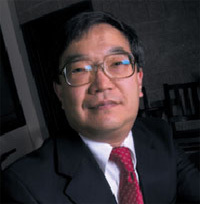 Dr. Fujimoto is a Fellow of the OSA, APS, and IEEE. He was program co-chair for the Conference on Lasers and Electro Optics CLEO ’02 and general co-chair in 2004. Dr. Fujimoto has been general co-chair of the SPIE BIOS symposium since 2003 and co-chair of the conference Coherence Domain Optical Methods in Biomedical Science and Clinical Applications since 2000. He was co-chair of the European Conferences on Biomedical Optics in 2005. Dr. Fujimoto was a member of the board of directors of the Optical Society of America from 2000 to 2003. He was co-founder of Advanced Ophthalmic Devices, the company that transferred OCT to Carl Zeiss for ophthalmic imaging and co-founder of LightLabs Imaging, a joint venture with Carl Zeiss in the area of endoscopic and cardiovascular imaging that was acquired by Goodman, Ltd. in 2002.